The Black-crested Titmice (Baeolophus atricristatus) - also known as the Mexican Titmice - are small songbirds found in south central United States and Mexico. They were previously considered a subspecies of the Tufted Titmouse (B. bicolor) and these two species hybridize in a narrow zone in central Texas. 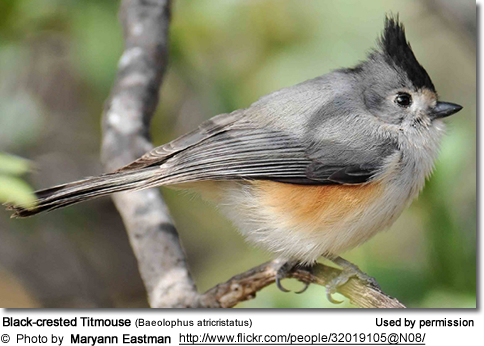 Both species were referred to as "Tufted Titmice;" however, since 2002, they have been considered separate species. 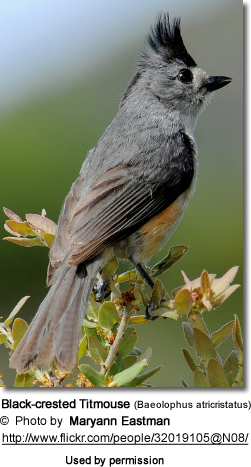 The Black-crested Titmice (as described on this page) are restricted to southern Texas, Oklahoma, and east-central Mexico; and can readily be identified by their black crests and pale or buffy foreheads. The Tufted Titmice are widespread across all of Eastern North America, and have grey crests and black foreheads. Black-crested Titmice occur naturally in southern and parts of western Texas, southwest Oklahoma, and north-central Mexico. Vagrants have been reported as far north and east as St. Louis, Missouri. One of their habitat requirements are heavy timber or urban shade trees - needed for roosting and nesting - and they are often found near bodies of water. They particularly like oak and mesquite trees (Proposis pubescens) and scrub. In Mexico, they frequent the edges of evergreen forests, as well as mixed Pinus-Quercus woodlands and forests in drier areas. Depending on their range, they are found at altitudes of 450 - 7,500 feet (150 - 2,300 meters). During the breeding season, they are usually seen alone or in pairs; during the winter, they form family groups of 6 - 8 birds or join mixed species flocks. Range: Southern Texas in Rio Grande Valley and northeastern Mexico. Range: Northern / far west Texas (Trans-Pecos) and southwestern Oklahoma south to northern Mexico (extreme eastern Chihuahua and northwestern Coahuila). Range: Western Texas and adjacent northeastern Mexico south to Sierra del Carmen in CoahuilaThis race is sometimes synonymized with ssp. paloduro (= considered one and the same). Black-crested Titmice are small birds that measure 5.5 - 6.7 inches (14 - 17 cm) in length, including the medium-length tail, which makes up about one third of this bird's entire length (head to tail). They have a wingspan of 9.1 - 11 inches (23 - 28 cm); and their average weight is about 0.74 oz (21 g). The Black-crested Titmouse has a long crest on its head that is usually erect. The crest is black in males and brownish in females. The upper parts are grey (except for a slight olive tinge in males) and an olive-brown rump. The plumage below is whitish / light grey and the sides have a reddish-brown wash. The forehead, face and throat are whitish. The small round bill is black. The eyes are dark brown. The legs and feet are pale bluish-grey. The female has a duller and paler crown and brownish crest. Her crest is usually shorter. Other than those differences, males and females look alike. Immature birds have browner upper parts and dull buff underparts. They have greyish-white foreheads, greyer crowns and shorter crests. Their sides are "rusty-colored" than those of the adults. 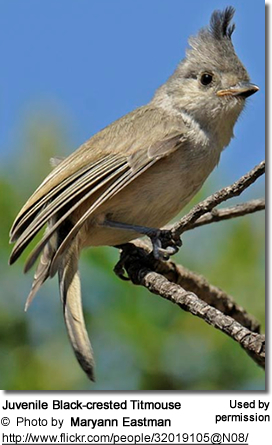 Juniper Titmouse, Oak Titmouse (Plain Titmice): Found in Western United States, outside the Tufted Titmouse's natural range. They are smaller and their plumage is a paler brown. Black-capped Chickadee or Carolina Chickadee: Slightly smaller in size. Have black and white heads without any crests. 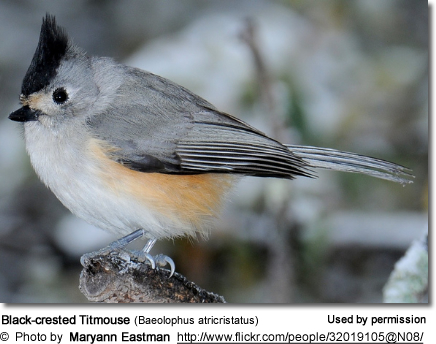 Black-crested Titmice reach reproductive maturity when they are about one year old. Pairs are monogamous, remaining together until the death of one of the mates. Males are dominant over females. Pairs defend their breeding territories year-round. Most breeding occurs during the warm months of the year, which is mostly from February to early June. Males strengthen their bond with the females by feeding them. As part of the courtship display, the the males adopt several postures that most favorably display their crests and orange flanks. They may raise one or two broods a season; and the young of an earlier brood often assist in raising the second. They nest in natural cavities in trees or fence posts; or in abandoned woodpecker nests about up to 23 feet (7 meters) from the ground. Or they take advantage of hollow metal pipes or artificial nest boxes. They line their nests with soft plant material, such as grasses, lichens, moss, leaves and bark, and other suitable nesting substrate, including shed snake skin, feather down and animal or human hair (sometimes plucked from live animals or humans near the nest). The nestlings are fed by both parents and sometimes the young from previous clutches assist. They fledge (leave the nest) when they are about 17 to 18 days old. Nest boxes are reused in successive years. Black-crested Titmice feed on a wide range of insect and invertebrate prey, including caterpillars, beetles, ants, wasps, bees, treehoppers, moths, flies, insect eggs, snails, and spiders; and therefore are valuable at keeping the populations of garden pests down and helping trees and plants by distributing their nuts and seeds that they carry away with them. They will also eat seeds, fruits, berries and nuts (including pecan nuts) and acorn. They are able to crack open nuts and seeds by holding them under their feet and hammering them with their bills. Most foraging is done on trees as they search on trunks and limps for insects in the crevices of the bark. They will also wander around on the ground in their search of suitable food items. These active little birds will hop from branch to branch, hang upside down, or sometimes hover in flight to reach their prey. They will also take advantage of bird feeders - even more so in the winter, when their favorite food item - insects - are hard to come by. They are most fond of sunflower seeds, but will also take other seeds, peanuts, suet and mealworms. They will store excess food under bark or under objects on the ground for later retrieval and consumption. 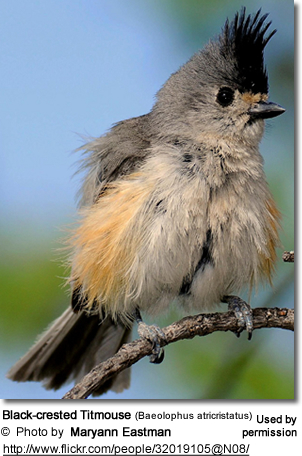 The average lifespan of Black-crested Titmice is about 2.1 years. However, the oldest recorded bird lived 13.25 years. Most birds don't reach their maximum lifespan as most of them die as nestlings due to predation by birds of prey, such as Cooper's Hawks, Sharp-shinned Hawks and owls; mammals, such as raccoons, opossums, squirrels, skunks and domestic rats; and reptiles, including snakes. Those that make it to adulthood can expect to live more than 2 years. Their vocalizations are similar to those of the Tufted Titmice - but shorter. Their contact calls are thin and explosive “tsit”. Their alarm / sentinel calls are a thin “see-see-see” or “sit-sit-sit”. as alarm call. Variations of their calls are described as “peew peew peew peew”, sharper “cher-cher-cher-cher-cher-cher-vet-vet-vet” or “ssi-cheh ssi-cheh.” Their songs are plaintive, repeated, ringing “chew chew chew chew” whistles or more slurred “p-lu p-lu p-lu” with higher second note.